My first foray into long-distance running was a sunburnt (in Scotland of all places! 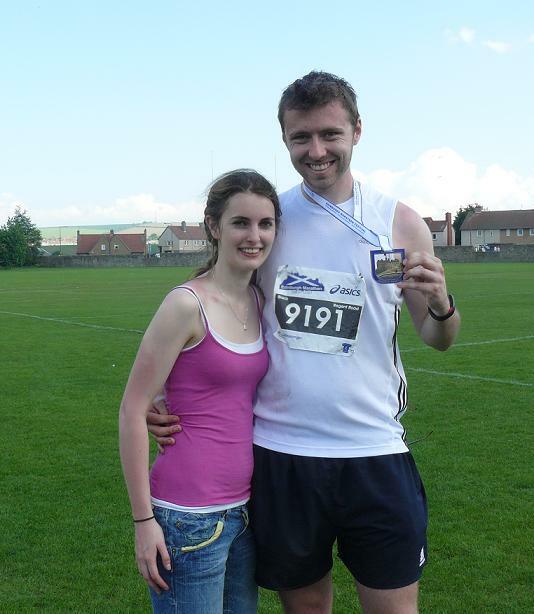 ), blister-ridden and rather slow Edinburgh Marathon in 2010. However, at the time, it ranked as one of my proudest achievements as it was something that I genuinely (and rather worryingly) considered might kill me off. Seeing the finish line (and crossing it) was definitely one of my most endorphin-releasing successes to date. About 6 months before the race, I was decidedly bored at work in a role which wasn’t hugely challenging on a day-to-day basis. I had just finished University where, despite a fair amount of time “developing yourself and finding your feet” (a.k.a. not working), you did actually regularly have a number of steep learning curves and it felt like you were achieving something. 20-odd years of academic learning (although some of my high school teachers may disagree about my ‘learning capabilities’) and then boredom: I needed a challenge and, if it weren’t going to be an intellectual challenge, I decided on the 1st of January 2010 that it would have to be a physical one. As someone who never really ran more than a few kilometres per week, if that, this was far beyond anything I’d contemplated before and would certainly be a challenge. Also. at the time of signing up, part of the plan was to be able to run (or walk some of) the marathon while my legs were still young enough to do so. That way, I could show off and brag about it to my lazy, overweight, TV-addicted grandchildren when I’m a decrepit old fart. So, grand-kids: switch the TV off, put your trainers on, get out there! Like any runner will probably tell you, training is actually a lot harder than the race. Months on end of trying to scrape out of bed on a Sunday morning to run 20+ kilometres in negative temperatures, Scottish gales and horizontal drizzle is not much fun, even for the most psychopathic of psychopaths. I had signed up at the start of the year which gave me ~20 weeks to train in the harshest of weather conditions. I became confident in my abilities a bit too quickly and went from doing nothing one week to 10km of uphill running a few weeks later. Naturally, I got injured and developed some nice shin splints which kept me sidelined for about a month. That, of course, was the main reason why I didn’t do win my first marathon…. After a few last minute dashes to the portaloos to relieve myself of last minute hour nerves, I set off with Pippa, my brother David and brother’s wife Sandra just as the sun cracked through the clouds. In a post-race email to my parents, I said that “You could tell that people were starting a bit too fast as, right from the start, I must have spent the first 3 miles being constantly overtaken”. That, or I had registered for the wrong starting group! The race itself starts in the centre of Edinburgh before rapidly getting out of town to Musselburgh (where it ends) and along the coast. From miles 14 to 21, it’s really in the sticks and a few stately homes which, while pretty, was a shame as it meant there was no-one to cheer you on (or put pressure on you for being lazy and walking). After 5 months of training in arctic conditions, the change in weather – whilst a good thing for topping up 6 million Scottish people’s vitamin D levels, did however make the race quite nightmare-ish. People were dropping off every few hundred meters, over 100 people needed first aid/emergency support and 1 guy died. I got the worst sunburn of my life (with wife-beater lines, of all tanlines to get…) which would take me a few months of living in the Caribbean to get rid of. The crowd, where present, were very helpful handing out sweets and bringing out the hoses to water down the runners (a life-saver!). My only real other mistake was a typical beginner’s mistake: I over-drank, a lot. As I was a) worried anyway about my ability not to die and b) worried about being dehydrated due to the heat, I must have drunk about 1L at every single water station which, over the course of a race, was probably about 6-7 litres of water. I don’t know what size my bladder is but it’s certainly not able to contain that much liquid! Cue a number of toilet breaks throughout the race and a slightly queezy-feeling stomach throughout the race. Still, I didn’t drop dead of dehydration! Having picked up my (seriously heavy – I could use it as a hammer!) medal, tshirt and bag full of pointless corporate plastic tid-bits, I thought the painful bit of the day was over. How wrong I could be. Sixty minutes of being sat in a bus back from Musselburgh with a bladder on the verge of exploding was, without doubt, akin to giving birth without epidural if not worse. I even tried to relieve myself in my bottle (under my jacket…) but stage-fright stopped me from freaking out the other passengers. As we arrived back into the town centre, I ran to the nearest bush and thanked my lucky stars for my bladder-controlling ability born from years of drinking too many fizzy drinks as a teenager. Now to the physical rather than mental injuries: many painful blisters (see photo) for a few weeks, two nail-less toes (the nails of which would fall off in Barbados while swimming with turtles – maybe a new food web for them?!) for a couple of months and some seriously bad, crispy, crackly wife-beater sunburn for about three months. One day’s worth of Scottish sunburn would require three months of Caribbean sunshine to be removed: well, if I learnt anything from that day, maybe that was it! More disappointingly, a new job which involved very little time at home and routine meant that running totally dropped off my radar for almost 18 months.